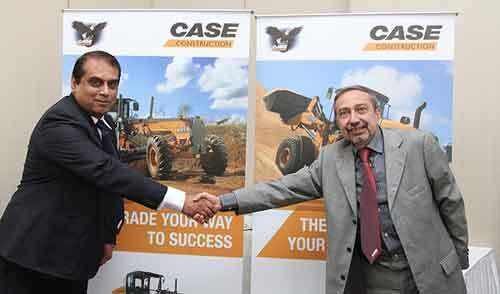 MUMBAI, India – (February 4, 2013) - Case Construction Equipment today launches its new B Series motor grader product line in the Indian market with the introduction of the Case 845B VHP (variable horsepower) and Case 865B VHP. The new Series will be showcased at the Bauma Conexpo show, held at the Mumbai Bandra Kurla Complex from February 5th to the 8th. Case New India have also up-gradated 752 Vibratory Compactor and have launched 2 other construction equipments namely F Series Wheel Loaders and B Series Motor Grader. The Case B series motor graders are already successfully sold in the Americas as well as in Africa, the Middle East and Russia where they are acknowledged for their ability to work in all environments guaranteeing high productivity results. Mr. Anil Bhatia Director Sales and Marketing Case India Pvt Ltd. The new graders feature an FPT Industrial 6.7-liter engine with triple horsepower ranges on the 865B model and dual horsepower on the 845B to match the power requirements of various applications and deliver optimum fuel efficiency. They are equipped with a forward-mounted articulation joint and rear-mounted cab, giving operators a commanding view of the complete mould-board and ground-engaging equipment. The spacious cab offers improved control layout, while maintaining the traditional 9-lever motor grader controls preferred by most operators. Case has designed the B Series motor grader line with proven technology to provide superior operator control, visibility and comfort. The controls are positioned within easy reach, and the cab position provides the best view to the blade and other ground-engaging equipment. For example, the hydraulic control valve on the 865 is designed specifically for grading applications, giving operators accurate control for the work being performed. The Case circle design, with outer-facing gear teeth, improves operations and serviceability, maintains gear power and increases the life of circle drive components. An exclusive multi-radius, involute mouldboard lets the Case B series grader move more material with less horsepower and less fuel than competitive models. Consistent with the Case tradition of easy serviceability, the B Series motor graders feature a flip-up hood for easy engine compartment access. The machine design also incorporates the Case hallmark ground-level access to daily service checkpoints for quick and efficient maintenance. “The new graders complete the vibratory compactors range, in which Case is market leader, offering solutions for the road and maintenance segment with high-tech products, recognized for their high efficiency, high productivity, reliability and low fuel consumption.” said Piero Arrivabeni, Head of APAC ProductMarketing for Case. For further motor grader product specifications, and more, please visit www.casece.com. For a Case motor grader demonstration, see your local Case dealer.